Republican lawmakers are working to line up the votes for a budget deal that would give teachers more than the 0.4 percent raise offered in January by Gov. Doug Ducey. Gov. 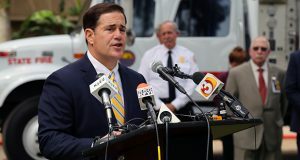 Doug Ducey today said lifting an enrollment cap that will be imposed as a school voucher program expands is “not even a consideration.” At least not at this time. The Arizona Senate Education Committee is set to consider two bills today that greatly expand the state's school voucher program. Gov. Jan Brewer has signed a bill that would help expedite the approval process for parents of some students in the state school voucher program.